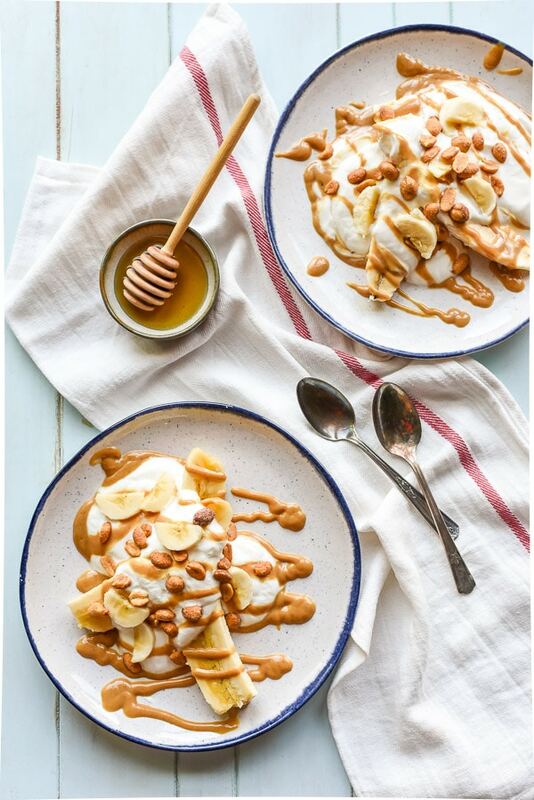 These Honey Peanut Butter Breakfast Banana Splits bring a classic combo to the breakfast table for an easy and fun meal! I have witnessed my child placing all kinds of inedible and horrifying things in his mouth. Mulch, rocks, hairballs, the dog’s toys…it’s all gone in without a thought. It seems like the kid would eat literally anything. That is, until I set actual real human food in front of him. Then suddenly he has quite a discerning palate. We’ve done our best to encourage our little guy to try a range of foods, but he still has a picky streak that can be frustrating and discouraging, especially when you’re the one doing most of the cooking. I mean, really, what I make can’t taste as bad as dirt, right? When my frustration reaches its worst points, I try to remember that food should always be a joy, not a battle. So rather than fight, I try to make food fun and delicious—a combination that’s hard to resist, even for a 2 year old. Last year, I made these Apple Cinnamon Breakfast Banana Splits, and they were a huge hit with all of us. They feel like a special treat, but they’re still a wholesome and filling option for breakfast or a snack. I knew I wanted to experiment with new flavors, so I turned to one of the best combos I know—peanut butter, bananas, and honey. The good ol’ PBB&H is one of my all time favorite comfort foods, and the combination translates equally well to these breakfast banana splits. 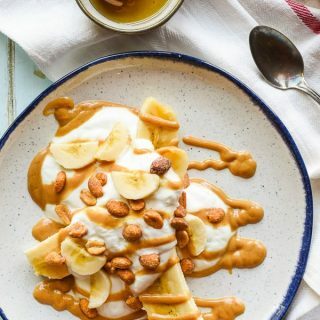 I’ve been stirring honey and banana slices into my Greek yogurt for years, but tossing peanut butter into the mix really kicks things up a notch. I like to stir the honey and peanut butter together, then microwave it until it’s the consistency of syrup. 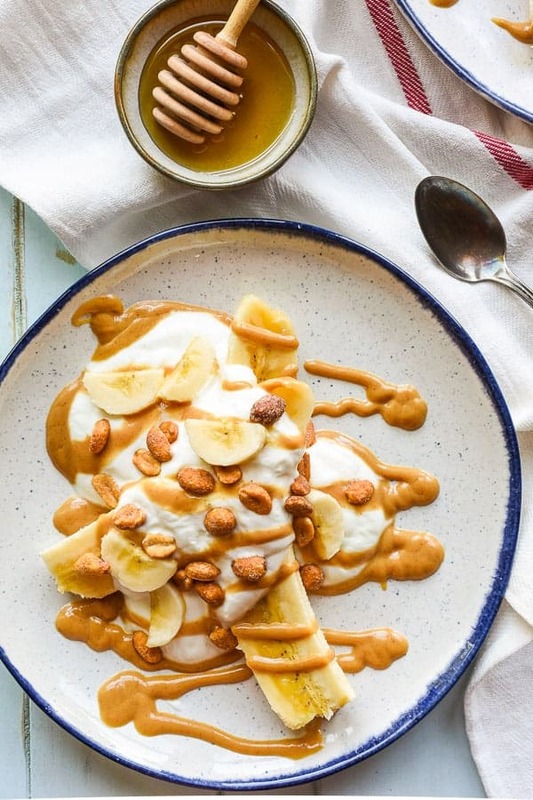 Drop a fresh sliced banana into a bowl, top with yogurt, drizzle with honeyed peanut butter, and then add a few honey roasted peanuts or Slow Cooker Honey Nut Granola for crunch. It’ll take you a whopping 5 minutes to toss this breakfast together, making it perfect for busy back to school mornings, or a quick snack for when the kids come home from school with a bad case of the hangries. 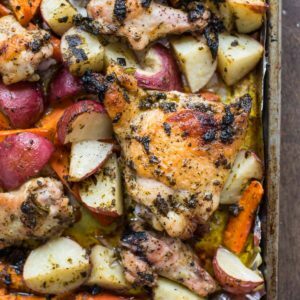 I love using honey in a range of recipes because of its versatility and ability to bring balance to savory, bitter, and tangy foods. For more inspiration and creative recipes, visit honey.com and learn how you can incorporate this natural sweetener into your daily routine. 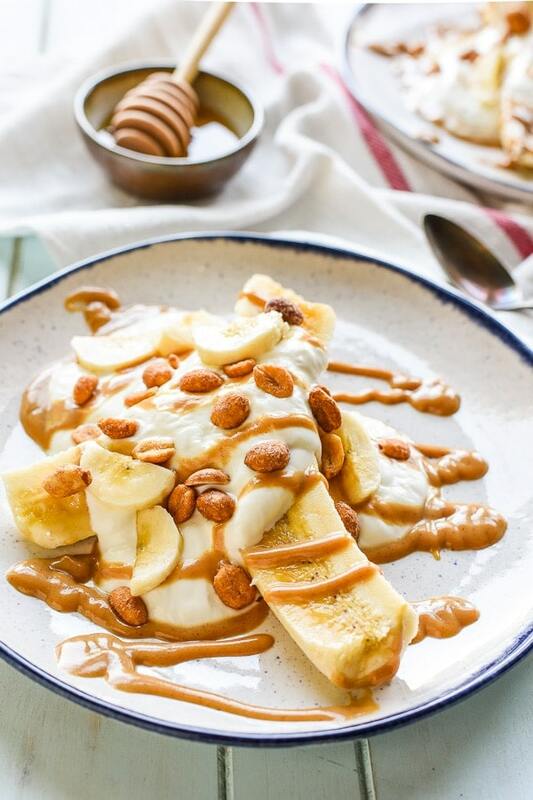 This easy 5 minute breakfast is made with a sliced banana, yogurt, and a honey peanut butter drizzle for an awesome breakfast banana split! Use a knife to split the banana in half lengthwise. 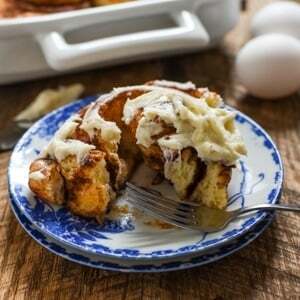 In a small bowl, stir together the peanut butter, honey, and pinch cinnamon. Microwave for 10-20 seconds or until the mixture is pourable. In a bowl, layer the banana and yogurt. Drizzle the peanut butter mixture on top. Top with peanuts or honey nut granola. Serve. This post was developed in partnership with the National Honey Board. As always, all opinions are my own. Banana split for breakfast? Count me IN! Love love love this idea- nothing better than PB and banana! Agreed! One of my favorite comfort food combos. Oh dear ! Love your idea of serving favourite ingredients ! Thank you so much !